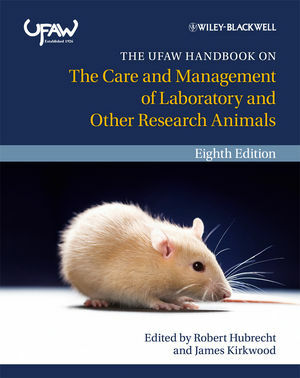 This book is published on behalf of UFAW (The Universities Federation for Animal Welfare), with whom we also publish the UFAW/Wiley-Blackwell Animal Welfare Book Series. This major series of books provides an authoritative source of information on worldwide developments, current thinking and best practice in the field of animal welfare science and technology. For details of all of the titles in the series see www.wiley.com/go/ufaw. Robert Hubrecht BSc PhD CBiol FIBiol is Deputy Scientific Director of the Universities Federation for Animal Welfare (UFAW). James Kirkwood BVSc PhD CBiol FIBiol MRCVS is Chief Executive and Scientific Director of UFAW. UFAW is an internationally recognised, independent, scientific and educational animal welfare charity concerned with improving knowledge and understanding of animals’ needs in order to promote high standards of welfare for farm, companion, laboratory, captive wild animals and those with which we interact in the wild. 1 Introduction (Robert Hubrecht and James Kirkwood). Part 1 Implementing the Three Rs in research using animals. 2 The Three Rs (Jon Richmond). 3 The design of animal experiments (Michael F.W. Festing). 4 Introduction to laboratory animal genetics (Michael F.W. Festing and Cathleen Lutz). 5 Phenotyping of genetically modified mice (Rikke Westh Thon, Merel Ritskes-Hoitinga, Hilary Gates and Jan-Bas Prins). 6 Brief introduction to welfare assessment: a ‘toolbox’ of techniques (Naomi Latham). 7 Welfare and ‘best practice’ in field studies of wildlife (Julie M. Lane and Robbie A. McDonald). 8 Legislation and oversight of the conduct of research using animals: a global overview (Kathryn Bayne, Timothy H. Morris and Malcolm P. France). 9 Planning, design and construction of efficient animal facilities (Barbara Holgate). 10 Enrichment: animal welfare and experimental outcomes (Robert Hubrecht). 12 Refinements in in-house animal production and breeding (Roger Francis). 13 Transportation of laboratory animals (William J. White, Sonja T. Chou, Carl B. Kole and Roy Sutcliffe). 14 Nutrition, feeding and animal welfare (Bart Savenije, Jan Strubbe and Merel Ritskes-Hoitinga). 15 Attaining competence in the care of animals used in research (Bryan Howard and Timo Nevalainen). 16 Positive reinforcement training for laboratory animals (Gail Laule). 17 Euthanasia and other fates for laboratory animals (Sarah Wolfensohn). Part 2 Species kept in the laboratory Mammals. 18 Wild mammals (Ian R. Inglis, Fiona Mathews and Anne Hudson). 19 The laboratory opossum (John L. VandeBerg and Sarah Williams-Blangero). 20 Tree shrews (Eberhard Fuchs and Silke Corbach-Söhle). 21 The laboratory mouse (Vera Baumans). 22 The laboratory rat (Jaap M. Koolhaas). 23 The laboratory gerbil (Eva Waiblinger). 24 The Syrian hamster (David Whittaker). 25 The husbandry and welfare of non-traditional laboratory rodents (Chris Sherwin). 26 Voles (Jonathan J. Cooper). 27 The guinea pig (Sylvia Kaiser, Christine Krüger and Norbert Sachser). 28 The laboratory rabbit (Lena Lidfors and Therese Edström). 29 The ferret (Michael Plant and Maggie Lloyd). 30 The laboratory dog (Judy MacArthur Clark and C. Jane Pomeroy). 31 The domestic cat (Sandra McCune). 32 Pigs and minipigs (Wolfgang Holtz). 34 Sheep and goats (Colin L. Gilbert and Keith M. Kendrick). 35 The horse (Fernando Montesso). 36 Marmosets and tamarins (Hannah M. Buchanan-Smith). 37 Squirrel monkeys (Lawrence E. Williams, Alan G. Brady and Christian R. Abee). 38 Capuchin monkeys (James R. Anderson and Elisabetta Visalberghi). 39 Old World monkeys (Sarah Wolfensohn). 40 Chimpanzees (Steven J. Schapiro and Susan P. Lambeth). 41 The domestic fowl (Ian J.H. Duncan). 42 The Japanese quail (Kimberly M. Cheng, Darin C. Bennett and Andrew D. Mills). 43 The zebra finch (Ruedi G. Nager and Graham Law). 44 Pigeons and doves (Anthony McGregor and Mark Haselgrove). 45 The European starling (Melissa Bateson and Lucy Asher). 46 Terrestrial reptiles: lizards, snakes and tortoises (John E. Cooper). 47 Aquatic reptiles (Simon Tonge). 49 Fish (James F. Turnbull and Iain Berrill). 50 Cephalopoda (Bernd U. Budelmann).